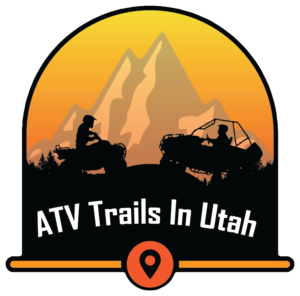 Getting your ATV (All-Terrain Vehicle) & SSV (Side-by-Side Vehicle) ready for the summer riding season is a must. The last thing you want to happen is to be out on the trail somewhere and have trouble with your machine. We have compiled a list of items you should address at least each spring in order to have your ATV and SSV in good working condition. (In this article use of the term SSV “Side-by-Side Vehicle,” will include SSV’s and UTV’s.) With all of the items listed below we strongly suggest that you refer to your specific owner’s manual for further information and specifications that apply directly to your machine. If it’s more than you want to handle then your dealer will be happy to assist you. Start by looking around your machine. Look for signs of disrepair and repairs that need to be done. Are there any fluids leaking? Are there broken parts that you can see or are there any missing parts? Do a thorough walk around just like you would if you were renting a car. However, this is more important because this is your vehicle. The first place you should start is with the fuel system. Gasoline can go bad if it has set for a long period of time and has not had fuel stabilizer added to it. The gas can evaporate and the additives can separate. Bad gas leaves a varnish film in the fuel system and can plug small jets and orifices in carburetors. It can cause problems with the fuel-injection system. This will cause the engine to run poorly, if it will even start at all. This is especially important if you live in an area where Ethanol might be part of the gasoline mix. It’s easy to tell if you have bad gas. Remove the gas cap and smell it. It will smell old. If the gas is old and untreated, drain the fuel from the gas tank and carburetor (if you have one) and dispose of it properly. Clean the tank, carburetor and/or other fuels system as required. Dispose of the old gasoline properly. Put in fresh gasoline. If you used a fuel stabilizer when you stored your machine, then should be in good shape. If it’s been a since you filled up and smells bad you are better off to drain it and clean the system. If that sounds like a lot to do, then we certainly recommend a trip to your dealer or favorite ATV Repair Shop. In the future make sure you use a good quality fuel stabilizer before storing your machine for any extended period of time. 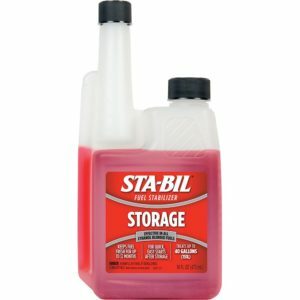 We have had good luck with STA-BIL Fuel Stabilizer. This product is very popular and is readily available locally or you can purchase it online. A battery that is old or not properly maintained during the winter is a huge problem or a huge problem waiting to happen. Ensuring that you have a good battery is very important. Putting a good battery tender on your battery in the fall when you store your ATV is a great idea. If you didn’t, we suggest you get one on right away. If you haven’t had the battery tender on all winter it will take a while to charge, providing that the battery is still good. After it has been on for the specified time according to the charger’s information, check it with a Digital Multimeter according to the meters instructions. Any reading over 12.60 is 100% charged. You can pick up an 11 function one at Harbor Freight for around $25.00. In some cases the battery on the ATV is not in a convenient place to get to in order to charge it. The battery tender that we recommend is a Deltran Battery Tender Junior. They are available online. (Click the picture below.) It has a 24 inch cord adapter with a quick connect that you attach to the posts on your battery and run the quick connect to a convenient place to get to. You just plug the charger in and you are set. 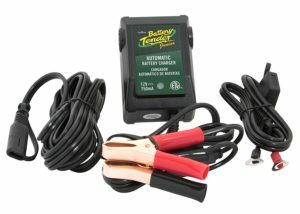 It also comes with some jumper cables that plug into the quick connect in case you need a jump or you need to give a jump. 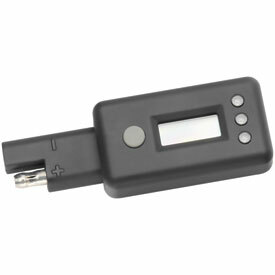 Deltran also has a plugin Voltage Meter that works great to check on your battery’s charge level. You should always check at the first of the season to make sure that the cables are connected securely to the battery. It doesn’t hurt to check them again during the summer just to be sure. A loose connection can cause some other problems. Always check the charge level of your battery before every ride. With the Deltran charging cable leads attached to your battery you can simply plug in the Voltage Meter to the end of the leads to see you charge level. Takes less than 30 seconds to check. A clean air filter can make a huge difference in the performance of your ATV. Most air filters are easy to access but it’s a good idea to check your owner’s manual to locate the access point. This should be checked at the beginning of the season and if you are doing any significant amount of riding during the year it should be checked often. Even if your filter doesn’t look like it needs cleaning at the beginning of the season it should be serviced. Filter oils over time suffer the effects of gravity and can run to the bottom of the filter or can even dry out to some a degree. Make sure that you start each season with a properly serviced air filter. There are several types of air filters out there so clean your air filter according to the manufactures recommendations. If your filter is pretty beat up then replace it. You don’t want to have a very costly engine repair because of a faulty air filter. While you are checking the air filter make sure that the inside of the air filter box is clean too. It is possible to get debris and dust in the box. Make sure you carefully clean this out and keep it clean on a regular basis. Pre-Filters are a good idea if you are riding in the sand or on dusty trails. K & N filters are very popular and most have a Pre-Filter that you can purchase separately that fits over your air filter. These are great for extending the time between filter cleaning. However, you need to check them and clean them often. We have used the Pre-Filters on our ATV’s and they are awesome. One last thing to remember. “If you have a relatively clean air filter, then it means that you are not riding enough.” Get out and get that air filter dirty. The beginning of each new ATV season is a great time to change the oil, especially if you have not been keeping track of the mileage and hours it has been since your last oil and filter change. Always remember that oil can lose its useful qualities over time, whether you are using it a lot or not much at all. Again, you don’t want to start down the road to costly engine repairs. We recommend that you use the oil that is recommended by your ATV manufacture or your dealer. Some recommend synthetic oil while others recommend traditional mineral based oil. Always change the filter when you do an oil change. It’s only a few bucks more and it will save you tons of money in the future. If you are riding a lot you may need an oil change during the season. We recommend that you follow your ATV manufacturer’s recommendations. Changing the oil on a SSV may not be as easy as on an ATV. If it’s a task that is too big give your dealer a call and schedule an oil change. It’s good to check your fluid levels at the beginning of the season. Coolant levels need to be topped off and the cooling system checked for leaks. Brake fluid needs to checked and refilled. Brake systems need to be checked for leaks. When filling your brake fluid make sure you are putting in the correct brake fluid type for your machine. It’s not recommended that you mix DOT 3 and DOT 4 fluids. The gear box oil level should be checked at the beginning of each new season. It should also be replaced according to the manufacturer’s recommended intervals. Always use the proper type and weight of oil. The gear box oil drain and fill plugs are usually easy to get to on an ATV. On a SSV it will require removing a seat and cover panel. Do not overlook this. While we are talking “Brake Systems” make sure that you are checking the brake pads. It is always a good idea to be able to stop when you are out riding. If your pads are thin then get them replaced. If these pads get too thin you most likely will damage the rotor which is an additional cost to a brake service job. Check your ATV manufacturer specs for pad thickness. Most ATV brake pads are easy to see to inspect. Some SSV’s will be a little more difficult to see. Some application may require the wheel to be removed. Some SSV’s and UTV’s may have brake shoes and drums. This is a bit more work to inspect. You can clean the shoes and drums with a good brake cleaner. You need to make sure that you get all the dust and debris out. If any of this seems too much, request your dealer to do an inspection for you. We just want to make sure you can stop. The last thing you want is a throttle cable to stick wide open or a brake cable to not activate the braking system. At least once a year inspect these cables for damage such as kinks in the sheathing, separation of the sheathing or rust and debris inside the sheathing. If you discover any of these conditions replace the cable. Otherwise, use a good, recommended cable lubricant. Not all lubricants will work. Use only a cable lubricant that is recommended by your ATV/SSV manufacturer. Chain and Sprocket: A chain and sprocket drive system are still common today. They are usually easy to get to in order to maintain, clean, adjust and replace. Follow your manufacturer’s recommendations and specification when dealing with a chain and sprocket system. Drive Belt: (CVT) A good percentage of today’s ATV’s and most SSV’s are using the Drive Belt System. In most cases the access point to these belts are easy to get to. In some SSV’s you will need to remove a seat and panel cover to expose the belt cover. The drive belt should be inspected annually for wear and cracks. If you find any significant wear or cracks replace the belt. If your owner’s manual doesn’t tell you how to replace it or you don’t have a manual, then you can Google it. You should be able to find a video on how to do it. In a lot of cases there will be a special tool you will need to expand the drive clutch to get the belt off. It is real important that you inspect the belt annually. These are a lot more fun to change in your garage than out on the trail somewhere. 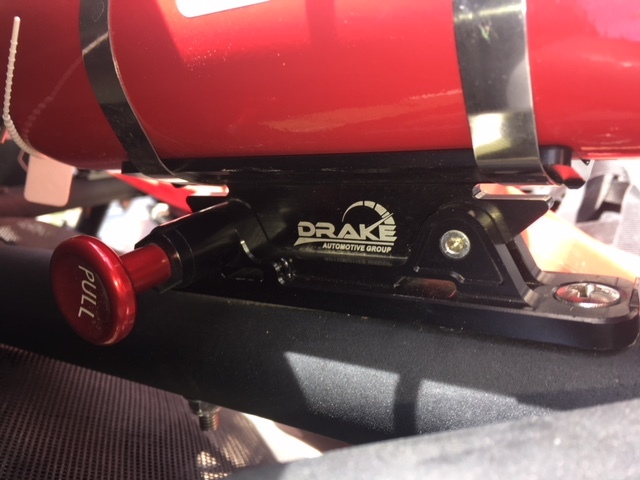 However, it is important that you are familiar with how to access the drive belt in the event that you do have to change one out on the trail. It’s also a good idea to have an extra belt with you. Shaft Drive: A shaft drive system has become popular in the ATV and SSV machine. These components are low maintenance but do require some attention. With shaft drive systems you will have a differential. If your machine has 4-wheel drive you will have two of them. The oil in these differentials need to be at the proper level and should be changed at the recommended intervals. Refer to your Owner’s Manual for location of differential drain and fill plugs. Use only the oil type and weight as recommended by your ATV Manufacturer or dealer. You will also have U-Joints on the drive shaft that will need to be greased. Tires tend to lose air. Make sure that your tires have the proper amount of air in them. Usually they run from 7 PSI to 9 PSI. Sometimes there will be a suggested PSI on the sidewall of the tire. This may not be the correct pressure for your machine. Consult your owner’s manual or a certified dealer for the proper air pressure for your particular ATV or SSV tires. An over inflated tire can be very dangerous. Inspect the overall condition of your tires. Things such as tread wear, cuts or gouges in the tread area and the sidewalls. Check for age cracking. You want to make sure that you have a reliable set of tires. You should always have a fresh tire repair kit with you all the time. You should also know how to repair a tire if you encounter a problem. Of course if you have to repair a tire while on out on the trail it’s a good idea to have a repair kit. Here is a link for a kit and a video on how to Repair the tire. Not only should you inspect your tires it is also a really good idea to inspect the wheels too. (My generation called them Rims.) When you are out on the trail your wheels can take a beating from rocks. Inspect them for dents and dings, especially around the bead. You can get a dent on the bead that can affect the tire holding pressure. Sometimes you can repair it, usually it’s a replacement. If you have bead lock rings make sure that you inspect them. The bolts can come loose so it is always a good idea to re-torque to manufacturer’s specs. And make sure the lug nuts are tight. It’s a weird feeling to see a tire pass you. One of the most over looked items in getting your ATV or SSV ready for the year is the location of the grease fittings. They are there for a reason. Certain parts need to be lubed. Your owner’s manual should help you locate them. Usually they are found in the front suspension parts, U-Joints and drive shafts. Make sure you locate them all and give them a shot of grease. Suspension parts should be check at the beginning of the season and in reality, all season long. Shock absorbers should be check for function. Are they bouncy? Check for oil leaking from the shock. Check the shaft to make sure it isn’t bent or broken. If you have a coil spring on your shocks, check them to make sure they are not broken. Tie rods and steering linkage should be checked to make sure they are not bent or broken. These are vital to the control of the machine. Any significant damage to these parts is a real safety hazard. Replace them. CV joints and CV Boots are over looked a lot. These should be checked after every ride, not just at the beginning of the season. If your CV Boot has a tear remove it and inspect the CV Joint for dirt, debris and damage. Always replace a damaged CV Joint Boot as soon as you can. If the CV Joint is damage, have it replaced. Every year you are required by law to renew the registration and tags on your vehicle. If your machine is Street Legal you will be required to have an inspection too. Always check to know when your registration and tags are due for renewal. Also check to see when your insurance is do for renewal. It doesn’t happen often but if you get caught without a current registration, tag and insurance you very well could get a citation, which can be very expensive. Below are Utah’s regulations. You can Google your particular state for this information. Check to make sure that your Headlights, Tail Lights and Stop Lights are working. If any are out, replace them. We recommend having a working fire extinguisher at all times on your vehicle. There are occasions that an ATV or SSV could catch fire. You always want you and your passengers to be safe. You also want to protect your very expensive investment and other property. It would be very sad if someone was injured in a fire or you lost your machine because you didn’t spend a few bucks to buy a fire extinguisher. You can pick up a 2.5 pound ABC fire extinguisher at the Home Improvement store for about $20.00. You can buy the expensive racing extinguishers online. Play it safe. Make sure you have at least one fire extinguisher with you that is easy and quick to get to. There are a variety of mounts online. 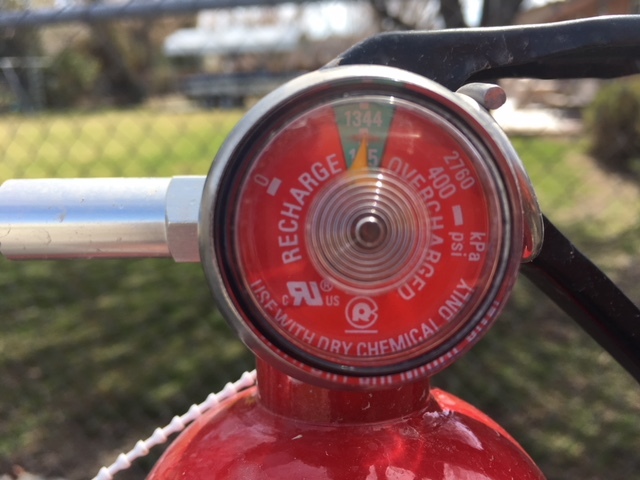 You can find some by Googling “ATV Fire Extinguisher Mount” for more options. However, in my research on mounts I decided on the Drake Fire Extinguisher Mount by Drake Off Road. It’s about mid-range in price but I liked it for it’s construction, it’s quick release and it’s mounting options. Click the link below to see information on this mount. As important as it is to have a Fire Extinguisher along, there are two other important things that go along with it. First, make sure at least once a year to make sure that the extinguisher is in working order. Check the gauge to ensure that the needle on the gauge is reading in the green. 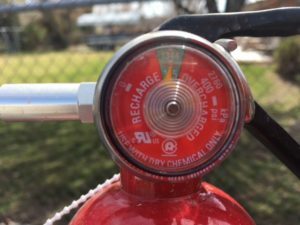 If the needle is not in the green then replace the extinguisher. Second, make sure that you are trained to use the extinguisher. It doesn’t do you much good to have a fire extinguisher with you if you don’t use it correctly. We have included below a short video that will instruct you on how to properly use a fire extinguisher. Always remember P.A.S.S. Restraints and Harnesses in your SSV are there for a very good reason. To keep you safe. So make sure you use them. Check them each year to make sure they are in good condition and work as they are supposed to. If they are questionable replace them. We don’t want you tossed out of your vehicle in the event of a crash or rollover. Some of us love to Accessorize our machines. If you have added any accessories make sure that they are installed correctly and in good repair. If you have additional lights make sure they are installed as per the manufacturer and in accordance with what your vehicle can handle. If you have a winch, it’s a good idea to make sure it works, just in case you need it sometime. Better yet make sure you know “how” to use it. Probably the most important thing you do at the beginning of each ATV season is to “Get Reacquainted with Your Ride.” It doesn’t matter if you have only been riding for a short period of time or if you are an “I’ve been riding for so long, I can’t even remember when I started” rider. The last thing you should do is to take that first ride of the season at 100 mph with your hair on fire. Slow it down and get to know that ride again. You might even enjoy some of the scenery as it goes by. While you are on this first ride you should check a few things. How do the brakes feel? Are they squishy? Do you feel confident that you can stop? Does the throttle work smoothly? Is it sticky? Does the steering pull to either side? Are there any rattles or bangs that shouldn’t be there? If you have any concerns get them checked out. The author of this article is not a certified technician. This material has been provided herein for educational purposes. You should always consult a mechanic or your vehicle’s service manual before performing any of the activities suggested in this article. The author and provider of this article disclaims all liability from any and all losses, damage or injuries that may occur by performing any and all of the above mentioned activities as described or shown.